The Bearkats Read To Succeed Program will announce its common reader book for the 2009-2010 academic year, “The Fly in the Ointment,” on Thursday (May 7). The event, which will provide faculty with information about the program, will be held from 2-4 p.m. in the Lowman Student Center Mall Area. Also during the event, faculty members will have the opportunity to discuss the infusion of the book into their classrooms with BRTS committee members, and those who adopt the program for their classes will receive a complimentary copy. Those who attend will also receive a free Popsicle. Written by Joe Schwarcz, “The Fly in the Ointment: 70 Fascinating Commentaries on the Science of Everyday Life” is an “examination of everyday science from the fanciful to the factual and covers topics ranging from pesticides and environmental estrogens to lipsticks and garlic,” according to the Amazon.com description. The book also looks at the science of aphrodisiacs, DDT, bottled waters, vitamins, barbiturates, plastic wraps and smoked meat; worries about acrylamide, preservatives and waxed fruits are put into perspective; and the mysteries of bulletproof vests, weight loss diets, green-haired Swedes, laughing gas, and "mad honey" are unraveled. A Montreal, Quebec, resident, Schwarcz is the director of McGill University's office for science and society. He is the author of Dr. Joe & What You Didn't Know; The Genie in the Bottle; The Healing Power of Vitamins, Minerals, and Herbs; Radar, Hula Hoops and Playful Pigs; and That's the Way the Cookie Crumbles. "Dr. Joe" has a weekly radio program and column in the Montreal Gazette called "The Right Chemistry." For more information, contact Rogers at 936.294.3422 or krogers@shsu.edu. SHSU’s Haven committee, the safe zone and support channel for homosexual students, will recruit faculty and staff participants during its final training workshop of the semester on Wednesday (May 13). The session, held from 1-4 p.m. in Lowman Student Center Room 302, will cover such things as vocabulary, slang terms, the coming out process and describe sexual/gender identity, heterosexism and the concept of privilege. Attending the workshop does not commit a faculty or staff member to become a Haven volunteer; they can decide afterward. To participate as a “safe zone,” faculty and staff members volunteer to simply serve as a presence for the university’s gay, lesbian, bisexual, transgender and questioning community. After the initial training, “maintenance is very minimal,” Collins said. Faculty or staff members' participation as a “haven” will be identified through a placard placed outside of his/her office, as well as through the Haven Web site. Workshops, currently open to only faculty and staff members, are limited to 20 and will be filled on a first-come, first-served basis. More sessions will be held in the fall. For more information on Haven, or to sign up for a workshop, e-mail haven@shsu.edu. Approximately 40 SHSU art majors graduating on May 16 will showcase the culmination of their years of learning at SHSU during an exhibit in the Gaddis Geeslin Gallery. The "Graduating Senior Exhibit" will begin Monday (May 4), with a reception following the commencement ceremony, which begins at 10 a.m.
A wide variety of mediums will be featured, including photography, painting, drawing, graphic design, printmaking, animation and sculpture. For more information, contact Harper at 936.294.1317. A variety of performances by this semester’s dance classes will be presented during both the non-majors’ and majors’ dance workshops, held Monday through Wednesday (May 4-6) in the Academic Building III Dance Theatre, located in Room 101. The non-majors' dance workshops will be held Monday and Tuesday at 7 p.m. The performances will showcase what each dance class, for students not majoring in dance, has done throughout the semester. Ballet classes will present a short lecture and demonstration about the fundamentals of ballet; the hip-hop class will present a hip-hop number, as well as the tap classes and jazz classes. During dance majors' workshop, held Wednesday, also at 7 p.m., choreography will be the primary focus, according to Gratz. Dance majors will give presentations of new and original choreography, as well as choreography by technique classes, with levels ranging from first-year majors' studies to graduate thesis materials. At the culmination of the major's workshop performances, awards of dance excellence, best choreography, professional standards, leadership, and service will be given to undergraduate and graduate dance students. “The SHSU dance program is highly regarded for providing excellent dance training,” Gratz said. “Part of that training involves performing in front of a live audience. “It is an important experience for the dance students and an entertaining time for the audiences,” she said. Admission is free for all three performances. For more information, contact Gratz at 936.294.1311 or cindygratz@shsu.edu. The SHSU School of Music will wind down the semester with four concerts beginning on Sunday (May 3). The collaborative recital will be held at 7:30 p.m. on that day in the Recital Hall. “Piano Warriors and Company Present: A Musical Showdown” will include students performing pieces for one piano and four hands, two pianos, and piano combined with either strings, woodwinds, or voice, according to Ilonka Rus, assistant professor of piano. The recital is free admission and will be followed by a reception. On Tuesday (May 5), students of Rus and director of keyboard studies Sergio Ruiz will perform a piano studio recital at 7:30 p.m. in the Recital Hall. The eight students will perform a number of classical pieces by composers such as Johann Sebastian Bach, Ludwig van Beethoven and Frederic Chopin, as well as a more contemporary piece by composer Alberto Ginastera. On Friday (May 8), the SHSU Jazz Lab Band and the Jazz Ensemble will help liven up “dead day” and kick off a weekend of jazz beginning at noon in the Kat Klub, located on the first floor of the Lowman Student Center. On Saturday (May 9), the jazz improv class will present its final jazz transcription projects from 9 p.m. to midnight in The Stardust Room, on the square in downtown Huntsville. Performing on the alto saxophone, French horn, vibraphone, flute, clarinet, drums, tuba, piano, guitar, trumpet, trombone and cello, students will perform transcriptions from such artists as Toots Thielmans, Wes Montgomery, Roy Hargrove, Johnny Hartman, John Coltrane, Gary Burton and Hubert Laws, among others. Admission is also free for both jazz performances. The spring semester will come to a close on Thursday (May 7). There will be no classes on Friday for the final exam study day, with final exams being held May 11-14. The final exam schedule is available online at http://www.shsu.edu/~reg_www/schedule/spring2009/general.html. Three spring commencement ceremonies will be held May 15-16, with speakers U.S. Senator Kay Bailey Hutchison, Texas State University System Regent Michael Truncale and educational consultant Mike Morrow. Early registration will close on May 8. Residence halls will close at noon on May 15 and reopen for the summer sessions on at 11 a.m. on June 8. Classes begin for the first summer session on June 9. Texas Mediator Credentialing Association has recognized James W. Gibson, SHSU’s Students’ Legal Services adviser, with an endowed scholarship in his name for his achievements in the field of mediation. The James W. Gibson Scholarship was announced April 3 at the organization’s meeting in Austin. Gibson was a founding member of the Texas Mediator Credentialing Association, the state association that issues a professional designation to mediators in Texas, and was board secretary for 10 years. The James W. Gibson Scholarship will be awarded annually at the TMCA’s annual symposium to a credentialed mediator in Texas who exemplifies the hard work, dedication, and professionalism that Gibson has demonstrated over the past 20 years toward advancing the profession of mediation in Texas, according to the TMCA. Among his accolades are being recognized as the “Texas Mediator of 2007” by the Texas Association of Mediators, an organization on which he served as a member of the board of directors. In addition, Gibson’s writings have been featured in many Texas publications for mediators and lawyers as part of numerous training manuals, and he published Texas’s first training manual for criminal mediation and co-authored the award-winning book “Capitalizing on Conflict,” published in 2002. Gibson is serving in his 19th year as the students’ legal adviser. He earned his Bachelor of Business Administration degree from the University of Texas at Austin, a Master of Science degree in criminal justice from SHSU, and a Juris Doctorate from Southern Methodist University’s School of Law. 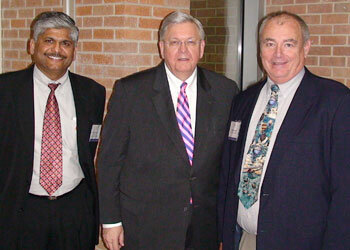 General business and finance chair Bala Maniam, with conference keynote speaker Phil Wedemeyer and business lecturer Chip Matthews. More than $10,000 was raised for general business and finance scholarships and approximately 90 professors and students from around the world participated in SHSU’s First Annual General Business Conference April 17-18. Fifteen tracks in the business disciplines featured speakers from the United States, the United Kingdom, Lebanon, Pakistan, Taiwan, Tunisia, and Malaysia. The conference succeeded in meeting three primary objectives, including raising money for scholarships and providing academicians and students with an opportunity to share intellectual contributions across the business disciplines through presentations. The top papers in finance, business communication, business law, taxation, technology, information systems, human resource management, and investments to be published in Allied Academies journals, according to Geraldine Hynes, associate professor in the department of general business and finance. Phil Wedemeyer, a partner in Grant Thornton LLP, gave the keynote address on the major elements of the current global financial crisis and where these events may lead in terms of regulation, accounting standards, and governance. Conference sessions highlighted research in business communication, business law, tax issues, equity markets, dividends and stock price behavior, the impact of the current credit crisis on banks, financial reporting issues, organizational behavior, marketing and management, information technology, and globalization. In addition, student papers explored international business and financial topics. Many papers were cross-disciplinary, underscoring the value of collaboration among the business disciplines, according to Hynes. The SHSU Department of General Business and Finance hosted the conference, with events underwritten by the SHSU College of Business Administration, Cengage Publishing and McGraw-Hill. Vic Sower, recently retired professor of operations management, received the 2008-2009 “Distinguished Service” award from the Southwest Academy of Management during the recent conference in Oklahoma City. During his career at SHSU, Sower, who taught from 1990 until 2008, distinguished himself as being one of only two professors to receive all three “excellence” awards. He was the 1996 recipient of the university’s “Excellence in Teaching” award, the 2001 recipient of the “Excellence in Research” award and the 2008 recipient of the “Excellence in Service” award. He also was named a 2005 Piper Professor by the Minnie Stevens Piper Foundation. Sower is co-author of three books, author or co-author of 22 articles in refereed journals, 29 articles in refereed conference proceedings, and numerous presentations. He holds a bachelor’s degree in chemistry from Virginia Polytechnic Institute and State University, a Master of Business Administration degree from Auburn University, and a doctorate in operations management from the University of North Texas. Sower has served the academy as electronic media director, track chair, session chair, discussant, presenter and doctoral consortium counselor. The Sigma Delta Pi National Spanish Honorary Society inducted 19 new members into the organization on April 23. Initiates include Lorena Argueta, Stacey Michelle Baldon, Andrea L. Bellamy, Homa Elayne Caldwell-Tomás, Jessica Nely Castro, Janet Concha, Isamar Doria, Luis Antonio Esquivel, Ramón E. Gonzalez, Sheryll Dawn Lamkin, Julia Eliza Milam, Mariam Rachel Rasmussen, Kristal Rubio, Maricela Sauceda, Nerieda Carolina Sánchez De Luna, Elizabeth Silva, Anna Michelle Smith, Megan N. Stump and Roxanna Villarreal. In order to be a member of Sigma Delta Pi, students must have taken at least 18 hours of Spanish in college with a "B" average and rank in the upper one-third of their graduating class. The ceremony was conducted by the officers of the Kappa Zeta chapter at SHSU. Family and friends of the initiates attended, as well as chapter sponsor Kay Raymond, associate professor of Spanish; Debra Andrist, foreign languages department chair and Spanish professor; Frieda Koeninger, associate professor of Spanish; and Rafael Saumell-Muñoz, professor of Spanish. Two faculty members and 11 students from the Sam Houston State University Japanese class and Japanese Culture Club reached out to the more than 20,000 Japan Fest attendees on April 25-26 in Houston in an effort to recruit students to SHSU. Staffing the Japan Fest booth included Yuki Waugh, foreign languages pool faculty member who teaches the Japanese class; Terry Waugh, industrial technology lecturer; and students Amy Balderas, Heather Brown, Daniel Buis, Jordon Burns, Paul Guidry, Don Knappenberger, Krista Kesseler, Jessica Kong, Jeremy Neroes, Lia Tyler and Ivan Wong. At the booth, visitors learned how to fold origami, according to Debra Andrist, foreign languages department chair. Our origami workshop brought visitors to our booth all day,” Yuki Waugh said. “We were busy teaching how to fold origami and sharing Sam Houston State University information with our visitors. “We used approximately 300 origami papers for our demonstrations and our visitors' participation,” she said. The group also distributed Sam Houston State University brochures, Saturdays @ Sam flyers, and Japanese class and Japanese Culture Club flyers, as well as pens, pencils, notepads, and stickers donated by the Vice President for Student Services Office, the Visitor Center, the Office of Multicultural and International Student Services, Bearkat One Card Office and the Student Services Office. In the near future, the Japanese Culture Club also plans to send volunteer students to public schools in the Huntsville area to share Japanese culture.